After a winter of eating heavy soups, roasted meats and hot casseroles, I’m ready for something light and fresh. This Chicken Caesar Pasta Salad is just the thing: light, fresh, full-of-flavor and filling. It’s just the thing to make for dinner on a busy weeknight or to take to a barbecue as a side dish. This is also a great recipe for using up leftover chicken. I sometimes like to roast a few extra chicken breasts in the oven when I’m making dinner one night to have some extra meat on hand for things like this. Alternatively, you can also use some rotisserie chicken from the grocery store if you don’t have any leftovers or time to put some chicken on the grill. 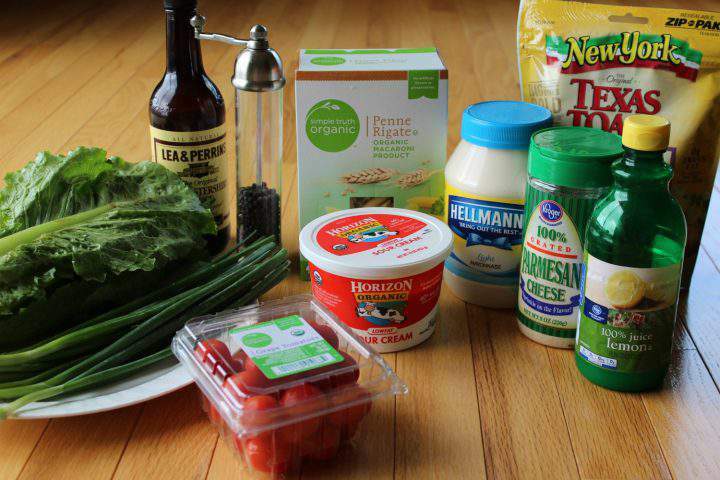 For the salad, you’ll need some classic caesar salad ingredients like romaine lettuce, croutons and parmesan cheese, as well as pasta (I used penne, but you could use a similar variety like ziti), chicken and the makings for the dressing. While the pasta is cooking, you can whip up the dressing. 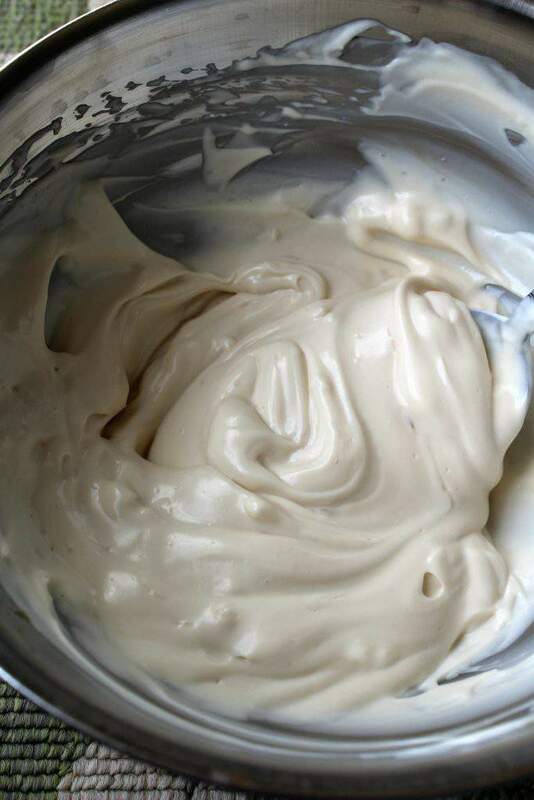 You’ll simply stir together mayo, sour cream, lemon juice, Worcestershire sauce, garlic and anchovy. The anchovy is optional, but it really does make for a more flavorful salad. After the pasta is done, be sure to drain it well, rinsing it with cold water to bring the temperature down so that you don’t wilt the lettuce. Toss the pasta with half the dressing and put it in the refrigerator for about half an hour to chill. The pasta will absorb some of the flavor from the dressing, making it extra yummy! While the pasta cools, you can prepare the rest of the ingredients for the salad, including chopping your chicken, lettuce and tomatoes. When you are ready to serve, combine the pasta with the remaining ingredients and dressing. We love eating this for dinner on busy nights because your protein, carbohydrate and veggies all in one dish, but it’s also a nice side dish to grilled meats or veggies. Using a small bowl, mix together the first six ingredients (starting with the mayonnaise through the Worcestershire sauce). Toss half of the dressing with the pasta and allow to cool in the fridge for 30 minutes. Mix in remaining ingredients, including the remaining dressing, and serve. I hope your family and friends enjoy this crowd-pleasing Chicken Caesar Pasta Salad at your next barbecue! Yum, we love to have salads in the summer. This recipe looks delicious, thanks for sharing it Erin! 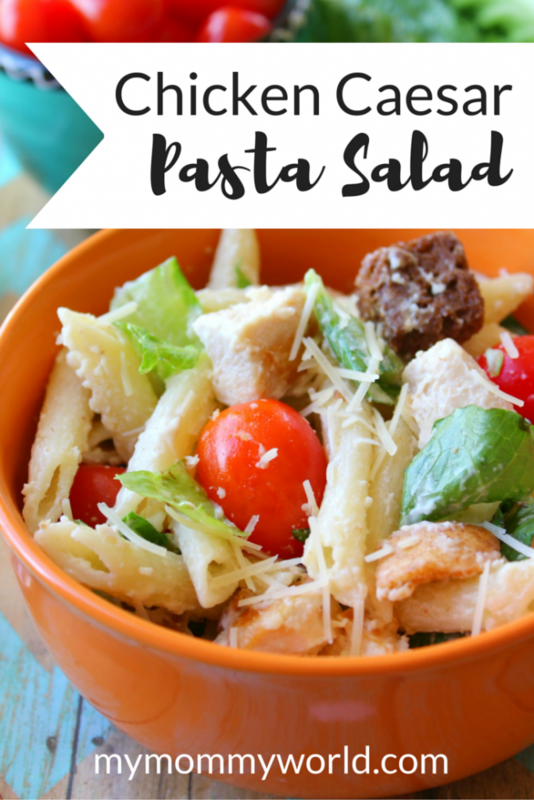 I love pasta and chicken ceasar salad, so this recipe is the perfect combination of both. I will definitely be giving this one a try. I bet my family will love it. Thanks for sharing.